What follows is a supplemental part of my first interview with Bryan, in which he expounds on his most personal creation, the 2014 miniseries “Furious,” and how the story’s origins originally came from a proposed Wasp story! 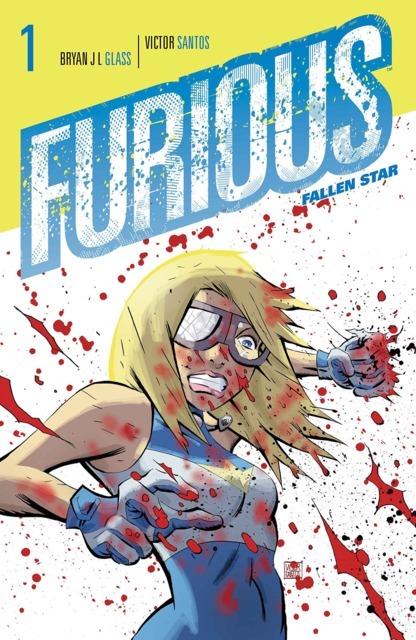 B: The comic book series Furious is my contribution to the realm of superheroes. What sets her story apart from the abundance of all the other superheroes available: Furious is “Cadence Lark,” former child star turned tabloid trash celebrity unraveling before the media eye; but after she hits rock bottom, she receives an experimental drug rehab that not only gives her that moment of clarity to realize what a monster of a human being she has become, but also leaves her with slowly evolving super-powers. She soon rationalizes that as an actress she can portray what the world expects a superhero to be, and by using her powers for good, believes she can achieve her redemption—easier said than done. As a character, Furious is very, very near and dear to my heart. I’ll give you some background on how Furious was created. My all-time favorite comic book series was Frank Miller and David Mazzucchelli’s “Daredevil: Born Again.” What I so loved about that series is that the opening two thirds are the disintegration of not Daredevil, but of Matt Murdock. You know from the opening couple of pages who the mastermind is. The audience knows that it’s the Kingpin who now knows that Daredevil is Matt Murdock and he has that great line, “Now to test the information.” The moment Kingpin sends out enough little pings to realizes it’s true, then he sets out to systematically destroy his greatest enemy—not as Daredevil but as Matt Murdock. The character of Matt Murdock is reduced to absolute rock bottom, becoming nothing before he is then reborn. 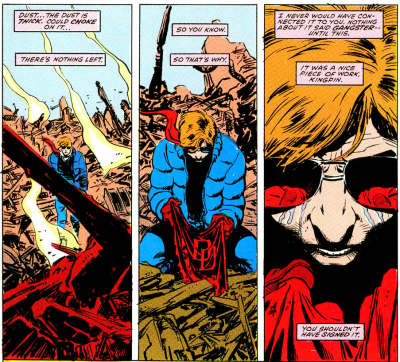 The character he becomes at the end is a very different Daredevil from the one that opened the story. I was so blown away. Again, I read that series as a monthly release; as each issue came out, and I was just riveted at the time. I couldn’t wait for each issue to come out! Frank Miller was responsible for doing this to his own beloved Matt Murdock, who he himself was responsible for reshaping. And it paved the way for Brian Bendis and David Mack and all those creators that followed. You kind of expect, in the gritty world of Daredevil and Matt Murdock that he would fall prey to a story like that. And I thought, what if that same exact technique was to be applied to the very least expected character you could imagine. While I’ve said as much in many interviews, I’ve never actually revealed who the character was (so you get this neat little exclusive). Furious began, for me in 1988/89 as Janet van Dyne, the Marvel Comics heroine known as Wasp. I wanted to subject that character to a “Daredevil: Born Again” style of deconstruction, and have that be my little thumbprint on the Marvel Universe. Of course, back in 1989 I had never published anything, and at the time female characters really did not sell for the publisher, and even the Wasp was viewed as a B-level character at best, closer to a C-level character at the time, who was never going to get a six-issues miniseries as I was envisioning. After a brief period of time trying to get this proposal into the hands of anyone at Marvel who might take it seriously, I came to the rapid realization, truly by 1990/91, that there’s no way this particular dream was ever going to happen. By then, the story I‘d created for the character, what was actually behind the mystery of her unraveling became something I was so proud of, that I realized that this was now a character I really loved. And what every creator inevitably learns is, if the door closes here, you develop it for someone else. If I couldn’t do this story as Janet van Dyne the Wasp, as many creators before me have done, I’d have to create my own version of that type of character. I spent the totality of the 1990s, while I was self-publishing a silly comics series Spandex Tights, trying all these incarnations of the character that would eventually become Furious, and with every incarnation I was getting her farther and farther away from the character who had inspired the story to begin with. That was a good thing. 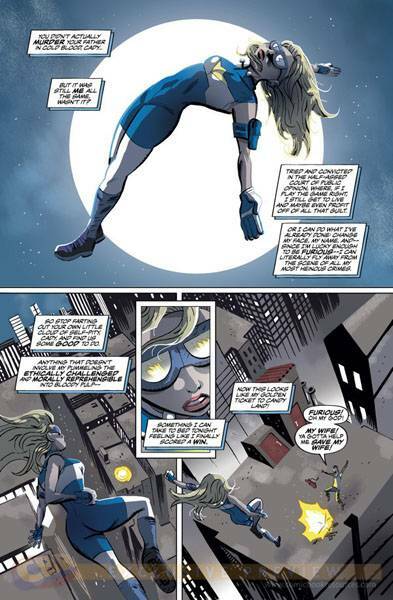 Ultimately, I came to the realization, as we were approaching 2000, that the real problem was that this superhero, whoever she was in the end, in order to chronicle her destruction, she needed a superhero universe around her. Every attempt I made to tell that story I really wanted to tell also required that I turn it into a Watchmen-like saga where I’m building a detailed universe at the exact same time I’m trying to destroy an individual character. Superhero universes are a dime a dozen. The only ones that people truly treat with any level of respect are those of Marvel and DC. They’ve been around the longest. The moment someone else creates a superhero universe, they are always immediately compared to the universes that are already known. It’s like, “Why do I need your pocket superhero universe when I’ve got the Marvel or the DC universes?” There are very few successful examples. Robert Kirkman’s Invincible is one, as he successfully created his own little pocket universe. There’s the Valiant universe, which succeeded to the point that it even came back from the dead! A certain very wealthy fan loved that particular universe so much that he wanted the one he’d loved so much in his youth brought back, so he bought the rights! Now they’re challenging the big guys. Valiant books are being considered for awards just like Marvel and DC. Huge kudos to those guys! For your average run of the mill creator, if you can say something interesting about the archetype superhero, you can create a one shot or miniseries: here’s your guy in armor, the patriotic hero, here’s the one that turns into a big monster, and everyone’s gotta have an archer, a speedster, etc. You can create that if you want, in a meta sense, make a larger statement about the genre via a stock superhero character or universe. In those instances, the point that one is making is far more important than the character. The character isn’t going to be identified by their individuality or whatever makes them tick, whatever makes them a compelling character, they’re but a means to an end for exploring an idea. Getting back to what became Furious—for more than a decade, even into the early aughts, every time I would even consider revisiting my character and her story that I really, really wanted to tell, I was stuck with “Yeah, but no one else is going to care.” I want to tell the story of this particular woman, whatever kind of character she turned out to be, that would ultimately be this redemptive tale, yet all the baggage that would go into building her world, that would get in the way of the story I wanted to tell. The right ingredients were never, ever there. But it was always percolating in the background literally for decades. Sadly, the thing that actually sparked the creation of my final incarnation of the character was the passing of Whitney Houston. I was never a fan of her music, but I was of an age that I remember when her very first hit single debuted as a video on MTV. She was this teenager fresh from her church’s gospel choir, she was happy and bubbly and full of energy, and we proceeded to spend the next twenty or thirty years watching her disintegrate before our eyes. Patton Oswalt made a tweet calling out, remarking about those publicly exclaiming what an unexpected tragedy her passing was. He basically called everyone out and said (and I’m paraphrasing), we’ve been watching this happen for twenty years and no one lifted a finger to do anything. She’s been dying in slow motion before our eyes. That really clicked with me. I think it was two days later I had this inspiration during the day so that when my wife came home from home work I said, “Okay, I have to lay this out, I have to say it so I can remember it. 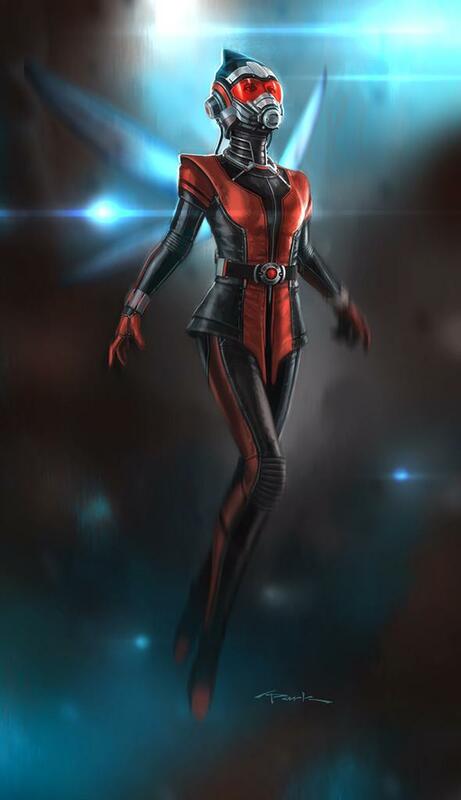 This whole Whitney Houston thing, this is the path for my old Wasp character.” Instead of building another redundant superhero universe, replace the superheroes with a universe of superstars. You don’t have to explain superstardom because it shows up on our computer every time we log on for the day and go to our news homepages. Or we go to Facebook or Twitter and we just can’t escape the latest outrages by the more self-destructive aspects of star culture. Using a math analogy, I replaced superheroes with media superstars and then reinserted the superhero. We ended up getting the five issues of Furious from Dark Horse Comics that are currently available. In my own grand vision of the character, there are so many more stories to tell, this is just the beginning of her saga. If all were to go well—it probably won’t happen at the current publisher, but it’s a creator-owned character so we are pursuing our options—but I have forty or fifty issues worth of stories that I would like to tell about the character Cadence Lark, aka Furia, aka Furious. Of everything of mine that’s been published, she’s the character that’s been with me the longest, so she has a very special place in my heart. There’s so much more I want to tell. Now I’m just being redundant. And I would be remiss not to acknowledge the contributions of artist Victor Santos, who took my ideas and in one weekend created the look of both the characters and the series as a whole. He even colored the series! After carrying her solo for so many decades, I could not be prouder to include Victor as my collaborator and co-creator! Many, many thanks to Bryan for being so generous with his time! Look for more from Bryan in future “Christ, Coffee, and Comics” posts!